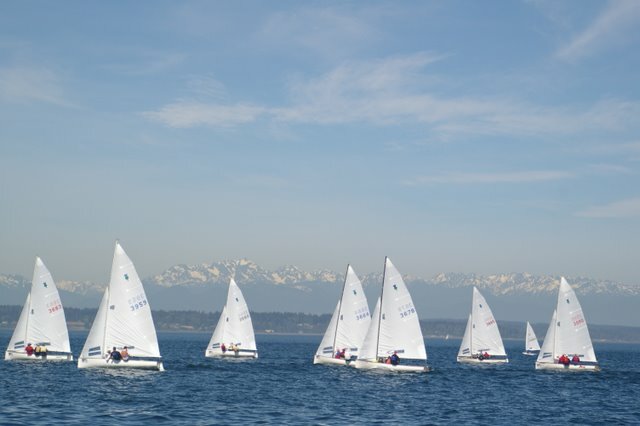 Photo of the Thistle Fleet on Puget Sound in the NOOD regatta. The Thistle is a beautiful, high performance racing dingy that combines grace with speed. Designed in 1945, the boat and class continue to thrive and are raced by dedicated enthusiasts and enjoyed by families alike. The boat has a planing hull and will plane in 10-12 knots of breeze but it also moves well in light winds and will outperform many larger boats in these conditions. Our class is very active with often more than 20 boats racing weekly on Lake Washington. Racing experience ranges from novice to expert with the Seattle Fleet home to 2007 Thistle National Women's Champion, Haley Lhamon and other former collegiate and top local racers. Skippers and crew of all skill levels are welcome. With a snow capped Mount Ranier in the background, colorful spinnakers and good sociable racing -- it doesn't get much better. We race locally on Wednesday nights from April to September with other regular regattas throughout the West Coast. A few enthusiasts sail all year round! Wednesday nights are Corinthian Yacht Club of Seattle races and are held out of Leschi Marina on Lake Washington. The address is near 320 Lake Washington Blvd, just North of the commercial buildings. Here's the 2011 Schedule for the Seattle Thistle Fleet.